How to Soundproof Home Theater and Increase the acoustic quality and maximize your home theater experience. Joe Heurta from Wellington, Florida had recently purchased his dream home. Joe decided to convert one of the extra rooms in his new house into a home theater, where he and his family could enjoy watching movies or playing loud music, but he didn’t want to spoil the otherwise quiet, tranquil environment of his home with noise seeping through the walls. That is when he decided to call All Noise Control for a free consultation. After contacting our dedicated team of experts at All Noise Control, we were able to come up with the key elements that go into soundproofing his home theater such as the sound isolation of walls and ceilings and adding mass to the surfaces as well as the various sound absorbing products, all in an environment that provides the ultimate in high touch customer service and after-sales support. When our customers have tried to cut corners in building their own personal home cinema or a man cave, they have often ended up being disappointed with the results. The start and end of their plan is often the purchase and installation of the television and sound system. Since most homes were not built with this custom use in mind, either reverberations and echoing effects ruin their enjoyment and instead of the pocket of listening and watching enjoyment they crave, they end up with noise so loud it disturbs the rest of the house and neighbors, or vibrations that at times even shake the walls of the house. However, when they decide they need the hands-on services our company is well known for, their experience dramatically changes. With nearly twenty years’ working in this market, many high-end clients have learned they can rely on us to provide the best expertise, custom products, customer support, and trouble-shooting that their hard-earned money can provide. 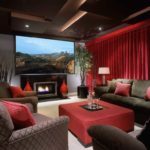 We can help you to soundproof your home theater room so you can take maximum advantage of the high end hi fidelity equipment and use it to maximum advantage. We even offer a variety of options for you to improve the performance of your walls, floors and ceilings, often without the unwanted expense and trouble of tearing anything down, forcing you to avoid areas of the home you just moved in to. Another area where we can help is to provide the sound absorbing products you will need to create a truly high-quality listening environment so you can enjoy the sights and sounds of your home theater while maintaining the tranquil environment your family demands. One area where we have particular expertise is in using the latest technologies to soundproof the walls, floors, and ceilings of your home theater/man cave so the high-intensity audio and video sounds your desire stay in the room with you where they belong. If you are reading this before you start to modify your home, even better. Better planning, as they say, produces much better execution. Taking time and consideration to review your noise control options before the room is completed can save you considerable money and time. Why spend the money to fix a problem when you can prevent having one in the first place? All Noise Control can help you to affordably prevent the problem before it occurs. The overall goal is to isolate the sound: Taking the time to ensure that your wall of sound does not disturb the hush and quiet your spouse desires in the rest of house can be accomplished by isolating sound from the walls and ceilings of your home, while the addition of materials to all surfaces in the room and, the finishing touch, using sound absorbing products to treat the reverberation, or reflection, of sound within the home theater will help solve many problems before they can begin.